Mr. Petraeus didn’t attend funerals held later for the two CIA contractors, irking some administration officials and CIA veterans. First, the WSJ, now the NYT: CIA Director David Petraeus is feeling a little heat from the spotlight regarding Benghazi. It’s an extremely soft-focus spot, however, one that obscures the most important question regarding Petraeus’ role in Obama administration mendacity in characterizing what was a planned terrorist attack as a violent melee growing from a “spontaneous” protest over a Youtube video. That most important question is, Why, three days after this terrorist attack that killed four Americans in Benghazi, did Petraeus go before the House Intelligence Committee and brief lawmakers that a Youtube video was to blame for a “spontaneous” protest — wholly fictitious — that “went on,” as ranking Democrat Dutch Ruppersberger told ABC on September 14 following the Petraeus briefing, “for two to three hours”? It was something that was planned; they did attack right away. There was no protest at all. 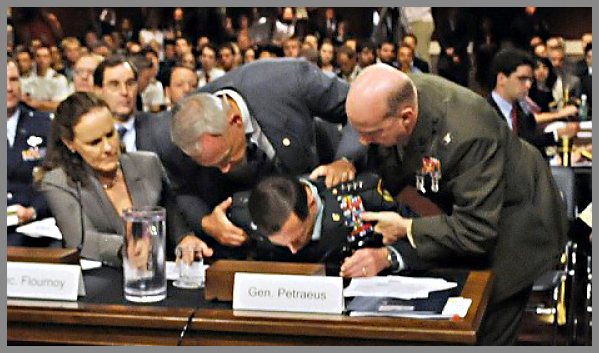 But that’s not what Petraeus appears to have told the Intell Comittee members. Why? Members of the Senate Armed Services Committee were also briefed today by Defense Secretary Leon Panetta and Vice Chair of the Joint Chiefs Admiral James Winnefeld. But senators emerging from that private briefing reported that they believed the attack in Libya was premeditated. In yesterday’s Journal story and today’s Times story, it’s important to note that there is no examination of the administration’s repeated lie that Benghazi was the result of a non-existent protest over a Youtube video “gone wrong” — a lie which Petraeus was a leading purveyor of. The Times’ Scott Shane gingerly raises and then abandons the subject this way: “Some news reports faulted his secret testimony to Congress days after the attack for supposedly supporting the view that it was not a planned strike but a spontaneous response to an offensive anti-Muslim video.” The Wall Street Journal doesn’t mention it at all. Who concocted this lie, why and when? Who pulled the plug on it following Obama’s September 25 UN address in which he cited the video six times (and declared: “The future must not belong to those who slander the prophet of Islam”)? That’s a timeline that needs to be established as much as any other. I suppose these latest MSM stories represent some modicum of progress: Remember those trial-turned-lead balloons that went up recently to exonerate the CIA (Petraeus), including the notion that the Benghazi terrorists might have watched the Cairo protests on TV and then planned the attack (Ignatius); or that the CIA’s bureaucratic layers prevented the truth that there was no “spontaneous” protest from getting to the top (Boot). But I don’t think we should be grateful, and certainly not satisfied. The MSM is still covering-up more than covering Benghazi, despite the Page One placement. In the aftermath of the assault, questions have been raised within the administration and on Capitol Hill about Mr. Petraeus’s role in responding to the attack. On Oct. 10, lawmakers grilled senior State Department officials about the attack. At one point, lawmakers and officials alluded for the first time to the existence of the CIA facility. That set off alarms at the agency and at the State Department because that information was classified. Some senior administration officials say they were surprised Mr. Petraeus went to that night’s private Washington screening of the movie “Argo,” about a covert CIA operation in 1979 in Tehran. That would have been on October 10. I noted that premiere here, as covered by the Washington Examiner, because it broke the Examiner’s recent months of silence on Huma Abedin by noting her presence at the screening — along with that of Petraeus. (Further establishing CIA party-presence, General Counsel Stephen Preston was also at the screening.) Such fun. Affleck, it turns out, is a huge fan of Petraeus, whom he calls “one of the most remarkable living Americans.” He likes Huma Abedin, too. Wonder if Abedin would extend the same hospitality to a movie called “Benghazi”? And would David Petraeus be able to make it to the DC premiere? This entry was posted in Al Qaeda, Benghazi, CORRUPTION, DEFENCE, Egypt, Hillary Clinton, Innocence of Muslim, Islam, Liberal Agenda, Libya, Libya Lynching, Muslim Brotherhood, NATO, New World Order, Post America, Sharia Law, Syrian Christians, Terror Attacks, Terrorism and tagged 5th column, Al Qaeda, Ambassador Stevens Raped, Arab Spring, Arab Winter, armed services committee, Benghazi attack, CIA Director Petraeus, Hillary Clinton, Islamic Jihad, Islamism, Leon Panetta, Libya, Libya Lynching, NWO, Obama appeasement, senate armed services committee, spontaneous protest, Terrorism, U.S. Ambassador to Libya Chris Stevens. Bookmark the permalink. 1 Response to Did Petraeus Cover-Up Benghazi Attack?